RYUGU RENDEZVOUS The Japanese space agency’s Hayabusa2 spacecraft (illustrated) has arrived at its target asteroid, Ryugu. After more than three years’ lonely travel through the solar system, the Japanese spacefaring robot Hayabusa2 has reached its home-away-from-home for the next 18 months: the near-Earth asteroid Ryugu. The Japanese Aerospace Exploration Agency on June 27 confirmed Hayabusa2's arrival at the kilometer-wide boulder, which circles the sun between Earth and Mars. The spacecraft is now hovering about 20 kilometers above Ryugu. Over the next several months, the spacecraft will touch down on the asteroid three times to gather samples, as well as deploy four landing probes to further explore Ryugu’s surface. Hayabusa2 will return to Earth with its cache of space rock near the end of 2020. 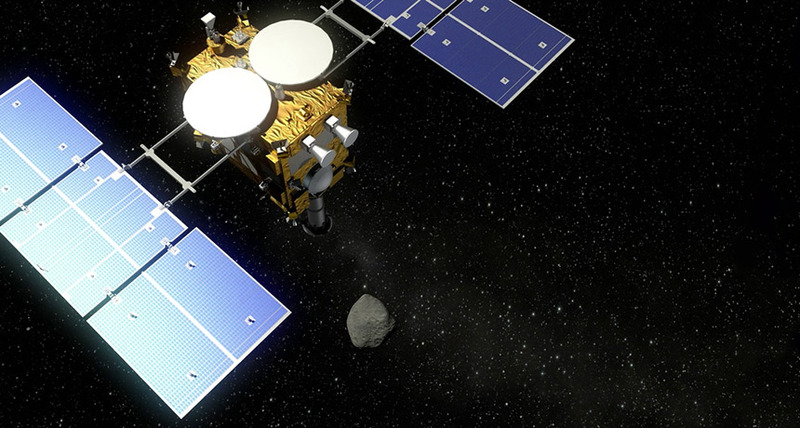 It follows in the footsteps of the original Hayabusa, which brought back samples from a different asteroid in 2010. Analyzing bits of Ryugu’s ancient, carbon-rich rock could give new insights into the composition of the early solar system and the origins of life. For instance, the samples could help confirm whether asteroids carry the simple sugar called ribose, which is an essential chemical component in the cells of every Earthling. If so, that raises the possibility that ribose arrived on Earth from elsewhere in outer space, rather than forming here on its own.